Is your sales pipeline showing what stage sales deals are at? Is your sales team workingon the right leads, at the right time? These are questions most growing small and medium sized companies face. And if you want to keep succeeding, your sales teams need to close more deals faster. With Sage CRM you can answer these questions, accelerate sales and generate a quicker return on investment. Katalina Media is a UK-based producer of films for businesses and corporations. The company's management wanted to target qualified corporate leads and scale the company quickly. To do this, they knew the company needed a more efficient sales process. The company purchased Sage CRM and today uses it to manage key sales processes. The company's sales team identify sales opportunities in Sage CRM, track them at every stage and act on real-time information to follow up with leads and customers Using Sage CRM, Katalina Media increased sales and has grown revenue by 240 percent year-on-year. Real-time business information: prepare for important sales meetings using up-to-date customer details. Powerful out of the box sales reports: make more informed business decisions faster. Accurate forecasts and opportunity management: see what stage sales deals are at in your pipeline. Sales opportunity tracking: progress leads, convert them to opportunities and allocate them to the right reps or teams. Sales dashboards: give sales executives and managers the information they need to see sales performances in real-time. Business Accelerators for Sales: track KPIs, help sales people become more productive and close sales faster. If you'd like to close sales faster and increase your revenues, download our free eBook Top tips for effective selling. Today's marketplace is more competitive than ever. Small and medium sized businesses are working with tighter marketing budgets, limited in-house resources and more demanding customers. Marketers need to access to customer insight so they can segment customers and prospects, and provide the right message, to the right people, at the right time. Businesses like Nexus Solutions and Island Lake Resorts Group are using Sage CRM to manage customer and prospect information and run more effective marketing campaigns. Established in 2001, Nexus Solutions provides integrated network communication infrastructure and internet security technologies to customers in Hong Kong, China, Taiwan and other Asian countries. Prior to purchasing Sage CRM, Nexus Solutions struggled to create marketing campaigns with consistent messaging for customers. Now, Nexus Solutions has a central bank of customer and partner information that its sales and marketing teams collaborate on for each campaign. Every day, Sage CRM helps businesses like Buffalo Sabres and Island Lake Resorts Group communicate with their customers. It can help your business too. Start a free 30-day trial today of Sage CRM and plan your next marketing campaign today. Wouldn't it be great if the customer support tools you use every day could scale up with your growing business? With the right tools, you can overcome the customer service challenges common to growing businesses. The Signature Works is a signage company which, during the 2000s, invested heavily in various IT tools. By 2008, these tools were reaching their end of life. And the rapid growth of The Signature Works posed several other key challenges. The Signature Works had to cater for an expanding user base and process more customer service requests. And it had to replace its older tools with a modern solution. The signage company also wanted to provide better support to new and existing customers. The management team of The Signature Works decided to purchase Sage CRM, and give employees instant access to the data they need to become more productive and efficient. Today, employees at The Signature Works are sharing relevant information between teams, providing even better customer support and using fewer resources to grow the business. The Signature Works is just one of thousands of business that use Sage CRM every day to deliver exceptional customer service. Provide first class customer support by starting a 30-day free trial of Sage CRM today. 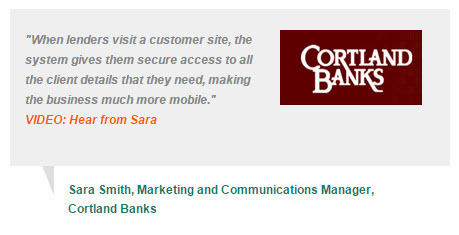 Cortland Banks is just one company that relies on mobile CRM to manage customer relationships on the road. Cortland Banks manages over 50,000 prospects and customers. Previously, the community bank used a system that caused duplicate entries and errors. This antiquated system made it difficult for lenders to work on site because they couldn't access critical business information on the road. Then, Cortland Banks purchased Sage CRM, uploaded key business data and began using mobile CRM. Now the company's employees are more productive, efficient and they can work from anywhere. According to Marketing and Communications Director Sara Smith, mobile CRM "allows our team members to have access to client details when they're at a client site." Like Cortland Banks, you can become a more efficient, productive and customer-centric business. Do you use email to communicate with customers, prospects and leads? Email marketing is one of the most effective marketing tools modern businesses have at their disposal. With minimal resources, small and medium sized companies can send personal, relevant emails to members of their mailing lists. With Sage CRM, you can send emails to up to 2,000 customers for free in Sage CRM using MailChimp. You can build campaigns using dozens of predefined templates or create a new template for your business. Once you've started a MailChimp campaign, you can view how recipients interact with the campaign emails and follow up with appropriate actions in Sage CRM. With Sage CRM, you can monitor open rates and responses to your campaigns in real-time. You can then use this information to improve future campaigns and increase your return on investment in Sage CRM. Today, Sage CRM is helping Wesgro retain existing business and create new opportunities. As a result, the company is enjoying a greater return on investment from its marketing campaigns. Please contact us today to discuss how Sage CRM and MailChimp can grow your business. Do you know what customers are saying about your brand, product or service online? Successful companies do. They gather information from online conversations, share this information internally and act on it. Then, they develop better relationships with customers and turn leads into sales. Whichever situation you are in, social CRM can help your business adapt, grow, and generate a quicker return on investment. What is social CRM ? Social CRM is a business strategy that enables the forging of richer, deeper and more intimate relationships with customers and prospects. It takes the valuable customer insight and conversations you may be gathering on social media and customer communities, and it layers them on top of emails, sales calls and customer service interactions, which you have stored in Sage CRM. Our customers use social CRM to develop business insight, generate leads and improve customer service. You can do the same. Cellular Solutions is a UK-based telecommunications company. It uses Sage CRM to engage with prospect and customers on LinkedIn, Twitter and Facebook. And by listening to what customers are saying on social media, Cellular Solutions generates more leads. Mike Bowers, Managing Director of Cellular Solutions says, "If people are finding you in multiple places, they're more likely to come to you when they're ready to buy." If you'd like to learn more about social CRM, please download our free eBook: Making every conversation count: A practical guide to social CRM for small and medium sized companies. Sage CRM and Sage ERP work better together. When you marry your Customer Relationship Management (CRM) and Enterprise Resource Planning (ERP) solutions, you can transform your business into a more customer-centric and efficient company. incoln Waste Solutions did it. For several years, the US-based waste management company used over 500 spread sheets to manage a complex customer service chain. As the company grew, it faced problems like inefficient business processes, inaccurate data and inconsistent communications. The company also wanted a way of improving customer service. Then, Lincoln Waste Solutions integrated Sage CRM with Sage ERP. The business was almost immediately able to simplify internal communications, share information between departments and improve customer service. Improve interdepartmental communications by enabling different departments to collaborate. Become more customer focused by making key information available across departments. Drive profitability with more productive employees and efficient business processes. As the owner or manager of a successful company, you may already know what an ERP or CRM solution brings to your business. You may have had less time to consider how Sage CRM integrates with Sage ERP and how they can make your business more productive and efficient. Don't worry, we wrote a book about it. Download Extending the power of CRM across your business and find out why modern businesses value an integrated CRM and ERP solution. Did you know you can manage any area of your business with Sage CRM Builder? Why Sage CRM Builder ? No two businesses are the same; that's why we created Sage CRM Builder. Our customers use Sage CRM Builder to manage areas of their business. They are planning events and training courses, tracking competitors, overseeing products and equipment, and implementing key business projects. Most importantly, Sage CRM Builder is helping them save time and money. You can discover how Sage CRM Builder can help your business by download our free guide Introducing Sage CRM Builder. This guide also shows what you can create with Sage CRM Builder and how these custom business modules can help your business. Sage CRM Builder is a powerful, accessible, and intuitive business tool for people who want more from CRM. It can help you adapt Sage CRM to suit the needs of your business. And now, Sage CRM Builder is just as powerful on your tablet or mobile device as it is on your desktop. If you'd like experience the power of Sage CRM Builder, start your free 30-day trial of Sage CRM today. What’s New Sage CRM 7.0!